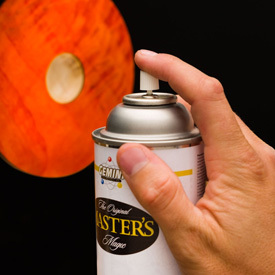 Recommended by Dale Nish, Masters Magic™ Spray Lacquer is a premium spray lacquer guaranteed to outlast traditional hand applied lacquer finishes. The high solids content of this spray make it an ideal finish for small turnings such as ornaments, boxes and pens where a durable satin finish is desired. A glass-like finish can be achieved by buffing the work piece using a buffing wheel and compound. A low luster finish can be achieved using 0000 steel wool and wax. For best results on open grain woods, use Masters Magic™ Sanding Sealer prior to finishing. 13 oz. aerosol. Comments On Mar 10, 2016:Short learning curve. Consistently flawless result. As good as a spray gun, but a bit more expensive. However, when you factor in the cleanup hassle after using a spray gun, the extra cost is a pleasurable expense. Comments On Nov 11, 2013:I use this on most of my smaller work. It dries extremely fast, so you can do multiple light coats quickly. Buffs out to a beautiful smooth finish. I'd recommend having good ventilation when using it. Comments On Sep 27, 2013:Looked for directions on spray can - none. Looked for product specs on can - none. I guess it's Spray and Learn. I did. WOW. What a glass like finish. Don't rush it, it's not as fast as some spray ons but the results will knock your socks off. I used three coats and couldn't believe the results. Glass like. Haven't even buffed it yet. And I may not.